North Carolina 9th district Republican congressional candidate Mark Harris, with his wife Beth, claims victory in his congressional race in Monroe, N.C. The race, however, has yet to be certified as authorities look into fraud claims in the eastern part of the district. 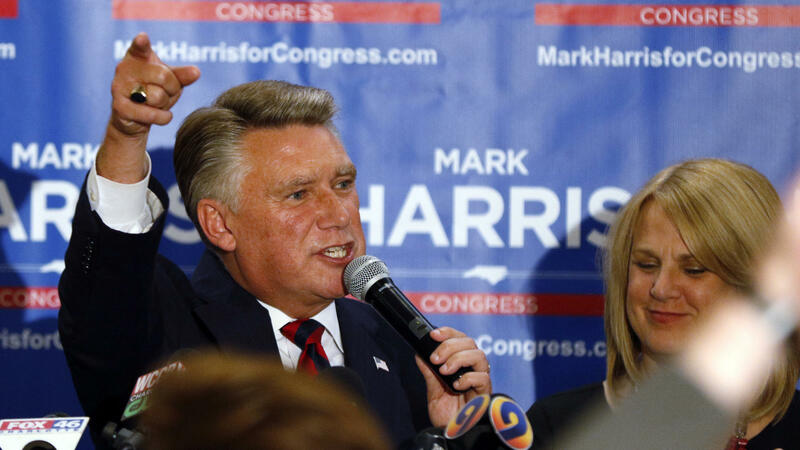 Today, Mark Harris is at the center of an election that just won't end in North Carolina's 9th Congressional District. The outcome remains up in the air pending an investigation into allegations of election fraud by an operative hired by the Harris campaign. It's the only remaining uncalled election of the 2018 midterms, but it's just the latest bump in a half decade of setbacks as Harris has had his eyes set on joining Congress. One of the early stops on his way included a stage in Charleston, S.C., in June 2015. Then a pastor a First Baptist Church in Charlotte, Harris spoke at an event aimed at encouraging religious leaders to run for office. He sang the first two verses of "This Little Light of Mine," admonishing the crowd of Christian leaders to sing along louder. "This is why the liberals are kicking our tails!" he growled with a smile. At the time, Harris had just run and lost in the 2014 primary race for a U.S. Senate seat. "I had recognized the emergency ... And I was willing to do whatever it took to be the man that God would use," Harris said in his speech. "And sacrifice whatever needed to be sacrificed." Now, North Carolina authorities are investigating just what exactly the Harris campaign was willing to do to win an election. Harris leads Democrat Dan McCready by 905 votes in the unofficial tally for the 9th Congressional District seat. But the state's board of elections is investigating potential election fraud there, focused specifically on the actions of a political operative who spoke with Harris frequently. Harris first made a name for himself in North Carolina politics in 2012, pushing for a ballot amendment that defined marriage as between a man and a woman. Chad Connelly, the former director of faith engagement for the Republican National Committee, says Harris connects with voters the same way President Trump did leading up to the 2016 elections. Trump won more than 80 percent of voters nationally who identified as white born-again or evangelical Christians. "It's really just authenticity,"said Connelly. "I think a large reasons the Hillary [Clintons] of the world lose is they come across as inauthentic. And I think Mark is the real deal." That doesn't mean winning elections came easy for Harris. After finishing third in the Republican primary for the U.S. Senate seat in 2014, Harris challenged incumbent House Rep. Robert Pittenger in 2016, losing that primary by fewer than 200 votes. "The guy has been through the meat grinder in terms of losing close elections," former North Carolina Gov. Pat McCrory told The New York Times. But those losses didn't stop Harris' political aspirations. He ran again in 2018, defeating Pittenger in the primary, and McCready in the general election, according to the unofficial tally, but not without questions and accusations. The investigation into whether ballot fraud took place is focused on McCrae Dowless, a local political operative based in Bladen County, who was hired by the Harris campaign to help with getting out the vote. Dowless is accused of illegally handling vote-by-mail ballots, and he's considered a person of interest in the North Carolina State Board of Elections' ongoing investigation. Harris says he was in frequent contact with Dowless throughout his primary and general election campaigns, which raises the question of whether Harris knew the techniques Dowless was using to get out the vote. The absentee ballot numbers in Bladen County were so far in Harris' favor that he would have had to win the vote of every single registered Republican and independent who turned in a vote-by-mail ballot, as well as some Democrats. Harris' attorney did not respond to an interview request from NPR, but Harris told member station WFAE that he knew of no illegal activity. "I almost took on a pastorly role to McCrae Dowless," Harris said. "I found him to be a very enjoyable individual that I chatted with. Everybody that I had talked to seemed to respect him and to love him, and I had no reason to think otherwise." 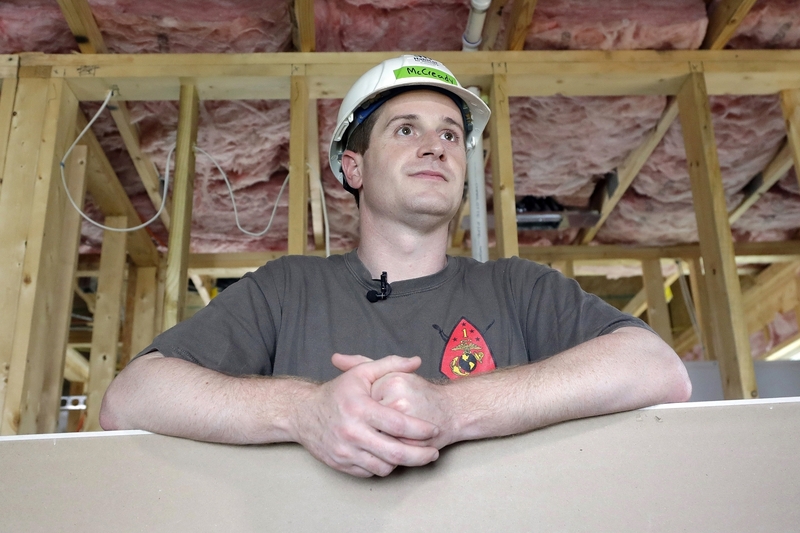 Democratic congressional candidate Dan McCready pictured in September 2018 at a Habitat For Humanity building event in Charlotte, N.C.
Election officials in North Carolina had been monitoring Dowless for many years however, going back as far as 2010 according to a recent report from The Associated Press. McCready, Harris' Democratic opponent, has called Dowless "a known criminal" and claims he "stole people's votes." Dowless, who has refused interview requests from NPR, does have a criminal record. The election investigation has state Republicans and Harris allies in a tough spot. They say that if fraud was taking place, Harris was unaware. "Mark Harris had no idea if there was anything illegal going on," said Tami Fitzgerald, a friend of Harris'. "And I say 'if' because it hasn't been proven yet." Fitzgerald, who's also the executive director of the lobbying organization North Carolina Values, said there also aren't enough ballots in question to affect the total outcome of the race. She describes Harris as a man of integrity, who would have reported anything illegal himself. A new North Carolina Board of Elections, made up of three Democrats and two Republicans, is expected to be seated on Jan. 31. That body's first order of business will be to determine whether a new election is needed in the 9th Congressional District, or whether Harris, after years of trying, is finally going to Washington. "The state has no option but to certify the election," Fitzgerald said. "Mark won the election. And Mark should be certified." So there is one remaining open seat in the U.S. House of Representatives. It was left empty because of an ongoing investigation into potential election fraud in North Carolina's 9th District. Republican Mark Harris is leading that race. And NPR's Miles Parks has this profile of a boisterous pastor who's been trying to break into North Carolina politics for the past half-decade. MILES PARKS, BYLINE: Before Mark Harris was the center of an election that just won't end, he stood on a stage three years ago in Charleston, S.C.
MARK HARRIS: "This Little Light Of Mine." Go ahead and get your lights up. Come on. Come on. Let's sing it together. (Singing) This little light of mine, I'm gonna let it shine. This little light of mine, I'm gonna let it shine. PARKS: He was there encouraging Christian leaders to run for higher office. At that point, Harris had just run and lost in the 2014 primary race for a U.S. Senate seat. He'd been pastor at First Baptist Church in Charlotte for the previous decade, often blending the spiritual with the political. HARRIS: (Singing) Hide it under a bushel. UNIDENTIFIED CROWD: (In unison) No. HARRIS: Oh, that was pathetic. HARRIS: No wonder the liberals are kicking our tails. Come on. Let's try it again. (Singing) Hide it under a bushel. HARRIS: (Singing) I'm gonna let it shine. PARKS: Harris made a name for himself in politics in 2012, pushing for a ballot amendment that defined marriage as between a man and a woman. Chad Connelly is the former director of faith engagement for the Republican National Committee. He says that Harris connects with voters the same way that President Trump did leading up to 2016. CHAD CONNELLY: This really just authenticity - and I think a large reason that the Hillarys of the world lose is they come off as inauthentic. And I think Mark Harris is the real deal. PARKS: That doesn't mean winning elections came easy for him. After losing that Senate race in 2014, Harris ran for a House seat in 2016 but lost narrowly in the primary. One politician told The New York Times that Harris had been through the meat grinder in terms of close elections. But that didn't stop his political aspirations. Here he is at that same event in Charleston, talking about what drove him to run for office. HARRIS: I had recognized the emergency. I was relying on God's hand to guide us. And I was willing to do whatever it took to be the man that God would use and sacrifice whatever needed to be sacrificed. PARKS: Now North Carolina authorities are investigating what the Harris campaign was willing to do to win last year. Harris leads Democrat Dan McCready by 905 votes in the unofficial tally for North Carolina's 9th District. But the state's Board of Election is investigating potential election fraud there. McCready accuses Harris of conspiring to cheat in the election. Here's a video he posted to supporters last week. DAN MCCREADY: Hey, folks, Happy New Year. As I'm sure you've heard by now, my opponent, Mark Harris, hired a known criminal, who then stole people's votes to try to win here in North Carolina's 9th District. PARKS: The investigation centers on McCrae Dowless, a local political operative hired by the Harris campaign. Dowless is accused of illegally handling vote-by-mail ballots. Harris says he was in frequent contact with Dowless throughout his primary and general election campaigns. That raises the question of whether Harris knew the techniques that Dowless was using to get out the vote. The absentee ballot numbers in Bladen County, the county where Dowless was based, were so far in Harris' favor that he would have had to win the vote of every single registered Republican and independent who'd turned in a vote-by-mail ballot, as well as some Democrats. Harris' attorney did not respond to an interview request from NPR. But Harris told member station WFAE that he knew of no illegal activity. HARRIS: You know, I guess you could even say I almost took on a pastorally role to McCrae Dowless. I mean, I found him to be a very enjoyable individual that I chatted with. Everybody that I had talked to seemed to respect him and seemed to love him. And I had, you know, no reason to think otherwise. PARKS: Election officials in North Carolina have been monitoring Dowless for many years, however. All of this has state Republicans and Harris allies in a tough spot. They say that if fraud was taking place, Harris was unaware. Tami Fitzgerald, the executive director of the lobbying organization North Carolina Values, also said there aren't enough ballots in question to affect the outcome. TAMI FITZGERALD: Mark Harris had no idea if there was anything illegal going on. And I say if because it hasn't been proven yet. PARKS: She describes Harris as a man of integrity who would have reported anything illegal himself. North Carolina is expected to determine next month whether a new election is needed in the 9th District or whether Harris, after years of trying, is finally going to Washington. Miles Parks, NPR News. (SOUNDBITE OF BOOKA SHADE'S "SACRED") Transcript provided by NPR, Copyright NPR.